When you hear the word “fetus,” I think a lot of people think it is just a blob of cells, or a mass of something. It was very revealing to me. I don’t think about abortion the same way anymore. I still have nightmares about what I saw. I took the assignment because I was at that time very pro-choice. I had even told my two teenage daughters that if one of them ever got pregnant at a young age, I would make them get an abortion. Haskell has sent a number of women to the hospital with serious complications and pioneered the dilation and extraction abortion, also known as partial birth abortion. 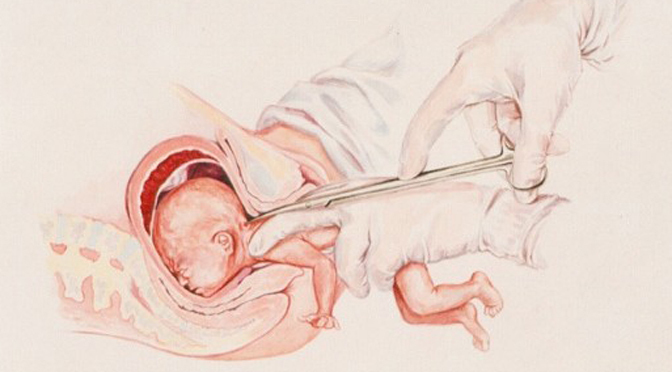 This type of abortion, which was banned in 2003 (and the ban upheld by the Supreme Court in 2007), consists of partially delivering a living preborn baby, and then puncturing her skull with surgical scissors to drain the brain. The infant would be delivered only until her head remained inside the mother, then the skull would be pierced and the brain suctioned out through a tube. This violent procedure was done to collapse the skull, which was considered too large to be safely extracted through the woman’s cervix. Schafer would witness several abortions committed by this method. Shafer worked in Haskell’s facility for three days – September 28, 29, and 30, of 1993. On the first day, she assisted in first trimester abortions. She noted in her testimony before a Senate subcommittee that one of the clients was a 15-year-old girl getting her third abortion. Disturbingly, the client “laughed” throughout the procedure. Dr. Anthony Levatino, who committed 1,200 abortions before he became pro-life, describes the procedure below. You can also see at the link the remains of a 20-week-old baby aborted by D&E method (warning: very graphic). On the third day, Shafer would see a partial-birth abortion procedure completed. She describes one, which was committed on a baby with Down syndrome at 26-and-a-half weeks. Dr. Haskell brought the ultrasound in and hooked it up so that he could see the baby (then 26 1/2 weeks into pregnancy.) On the ultrasound screen, I could see the heart beating. I asked Dr. Haskell and he told me that “Yes, that is the heartbeat.” As Dr. Haskell watched the baby on the ultrasound screen, he went in with forceps and grabbed the baby’s legs and brought them into the birth canal. Then he delivered the body and arms, all the way up to the neck. At this point, only the baby’s head was still inside. The baby’s body was moving. His little fingers were clasping together. He was kicking his feet. All the while his little head was still stuck inside. Then Dr. Haskell took a pair of scissors and inserted them into the back of the baby’s head. Then he stuck a high-powered suction tube into the hole and sucked the baby’s brains out. I almost threw up as I watched him do these things. I also saw third case that day (I was only assisting in one operating room.) This was a 17-year-old girl. She was approximately 25 weeks. The same procedure was done on this baby. The Down’s Syndrome baby was the only baby that had a defect. And that baby with Down Syndrome had the most perfect angelic face I have ever seen. I never realized how perfect these babies are at this point. When you hear the word “fetus,” I think a lot of people think is I did of just a blob of cells, or a mass of something. It was very revealing to me. I don’t think about abortion the same way anymore. I still have nightmares about what I saw. When Shafer went public with what she had seen, abortion activists scrambled to try and discredit her testimony. At the judiciary committee, a pro-abortion congresswoman read a statement from Haskell claiming that Shafer had never worked for him. She gave this testimony in front of Congress. The lie was easily exposed, and the congresswoman withdrew her accusation and explained it away by saying that there and been confusion over Shafer’s name. With his first lie exposed, Haskell then came up with a second – he and his employees wrote another letter, admitting that yes, in fact, Shafer had worked for him, but that her testimony was faulty because he did not commit abortions that late in pregnancy. Shafer’s rebuttal was to present excerpts from speeches that Haskell gave in which he admitted committing these abortions up to and beyond 26 weeks. Still another accusation was made that the abortionist did not use ultrasound while performing abortions, and that therefore, Shafer’s testimony was false. Shafer again referred to speeches that Haskell had made in which he described using an ultrasound while performing a partial-birth abortion. The parade of misinformation and distortions that were used to attempt to discredit Shafer all fell apart under examination, but the lengths to which the abortion side would go to try to discredit her is very telling. They knew how powerful her testimony would be. Abortion supporters still attempt to discredit facility workers who come forward with their stories. They know that their testimonies are some of the most powerful arguments against abortion that can be made.